Favorites: February 2014 - Cherry Colors - Cosmetics Heaven! I didn't post my favorites last month, because I don't go through so many products at once. I use the ones I like unill I run out of something and then I try something new. It is hard to change when the product you are using is your current favorite! 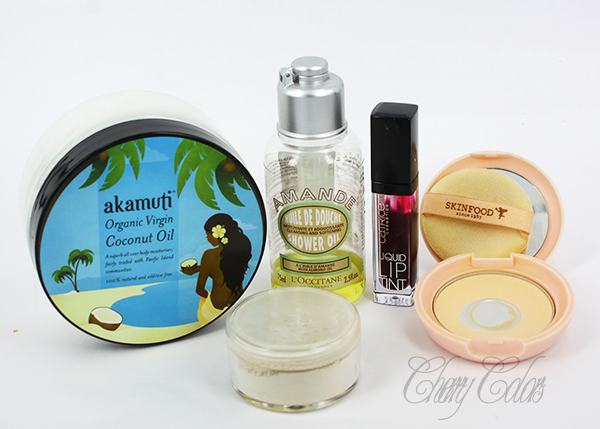 But this month I am back with some new favorites, not as many as last month (but there's no need for so many products in one post, right? ), but still worth a read. Akamuti Organic virgin Coconut Oil - when I was deciding if I should chose the jojoba oil or the coconut oil, I went with the last. They are both equally comodogenic so I hoped for the best. And luckily this little gem has helped with my skin problems a lot (I had dry, patchy skin and no cream could fix that!). Sweetscents green tea powder - This has been my staple through the years. I wrote about it, here. L'Occitane mandel shower oil - I love this stuff and I want to take showers all the time just because of it! It smells divine! Sadly I won't buy a new one for a while (because I have other stuff to use too, and you know because of €). Catrice Liquid Lip Tint - I think these have been discontinued recently? However I like lip tints. They are great as a starter thing for us, not lipstick wearing gals (I am trying!). I apply it whenever I remember to. Doesn't last for the whole day, but I don't mind. Has a sweet-ish taste that ends a bit bitter. Weird, but you shouldn't eat it anyway ;)!